Anxiety can be a natur al reaction to stressful situations. However, many people feel anxiety to such an extent that it interferes with everyday life. Anxiety can be a serious condition that makes it hard to cope with daily life. Everyone feels anxious from time to time, but for someone experiencing anxiety, these feelings aren’t easily controlled. Don’t worry though, as psychological therapy has been shown in research studies to be an effective treatment. 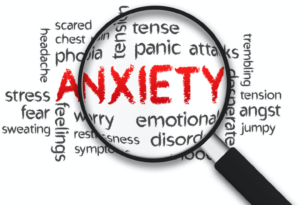 There are many types of “Anxiety Disorders” and the term anxiety is used as an umbrella term for a group of related conditions; such as acute stress disorders, generalised anxiety disorder, phobias, obsessive-compulsive disorder, and panic attacks. Generalised anxiety disorder (GAD) is characterised by exaggerated anxiety and worry about everyday life events with no obvious reasons for this concern. People suffering from Generalised Anxiety tend to expect the worst; they have difficulty suppressing their worry about issues such as their health, finances, family, relationships, work, and schooling. Often the fear and worry experienced is unrealistic or out of proportion to the situation. These negative feelings tend to take over the person’s life to the point where their fears affect their daily functioning causing them to reach burnout or engage in chronic procrastination. Social anxiety disorder, also called social phobia, is an anxiety disorder in which a person has an excessive fear of social situations. There can be intense nervousness and self-consciousness that arises from a fear of being judged or criticised by others. A person with social anxiety disorder might be afraid that he or she will make mistakes, look bad, and be embarrassed or humiliated in front of others. The anxiety can even build into a panic attack and the feeling like one needs to leave the social situation. Obsessive Compulsive Disorder (OCD) is a term used when anxious thoughts have undue influence on our behaviour. We all know what it is like to have a thought like “I may have left the oven on”, which leads us to checking the oven and keeping things safe. However, if a thought becomes obsessive (recurring), it can influence unhealthy patterns of behaviour that can cause difficulties in daily functioning. An intrusive and unwanted thought like “I’ve left the oven on” can lead to repeated checking that can interfere with daily life, or stop someone from leaving the house. People with OCD can perform rituals and habits, like cleaning, checking or seeking reassurance. If you are experiencing anxiety, it is important to seek help from a practitioner as soon as possible. Dr Zac Elizebeth Buchanan and Dr Ben Buchanan specialise in anxiety and can assist with the following treatments and strategies.